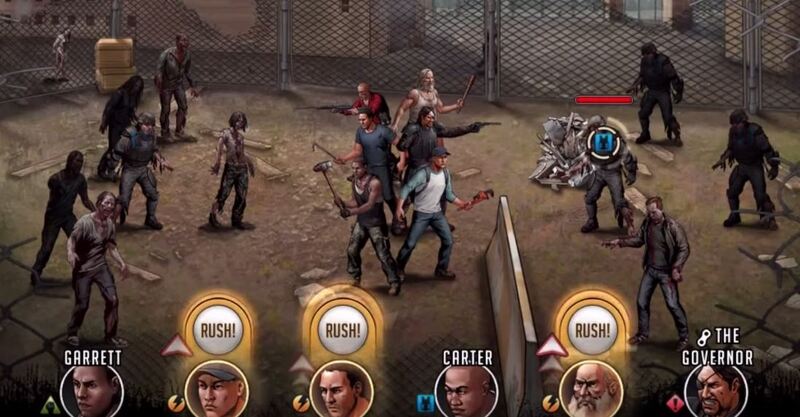 Today we want to share with you a basic guide for The Walking Dead: Road to Survival. If you’re new to the game or an advanced player, this guide should help you a lot in the game. In this guide we explain the basics of the game to you and this will provide you a good start in the game. Turn-based combat. The game offers an RPG-style combat system where the player controls a team of humans to battle walkers and hostile groups. Your team always goes first so turn 1 takedowns should be a top priority. Energy. There are two types of energy in the game. Mission Energy (RED) recharges in 9-minute intervals. This is used mainly for running Missions in the Campaign Story and Road Maps. Raid Energy (GREEN) is used for attacking other players (raids). It is on a 45-minute cooldown per unit. Adrenaline Rush. Each basic attack gives adrenaline, up to a cap. Upon reaching this cap, characters can perform a special move which replaces their basic attack for that turn. The adrenaline cap can be lowered through leveling (see YOUR TEAM). Adrenaline Rush effects can range from single-target/AOE damage to single-target/AOE heals or buffs. Each basic attack gives adrenaline, up to a cap, if this cap is reached the characters can perform a special move. Autoplay. The game offers an autoplay feature which makes characters attack and perform Adrenaline Rushes automatically. The player can cancel this at any point during his/her turn by pressing the autoplay button or the consumable item button. Consumables. During your turn, you can use various consumables which help your team survive. This feature is not available in Raids. Consumables can be crafted in the workshop, with new options available for research with each upgrade. The Roshambo wheel. Characters have one defining trait which dictates the stats they carry, the weapons they can equip, and their respective strengths and weaknesses relative to other traits. The wheel goes as follows Alert (RED/fire) beats Strong (GREEN/grass) beats Fast (YELLOW/sun or sponge?) beats Tough (BLUE/water) beats Alert (RED/fire). Ceasefires. Upon getting attacked by another player, a 2-hour ceasefire will be triggered. This prevents other players from attacking your town one after the other and depleting your resources quickly while you are away. Ceasefires can also be purchased with Gold- though this is a luxury reserved for players with excessive amounts of resources to protect. Resources. There are three resources in the game. Food is basically centered on character development/training. Wood is for base upgrades. Both are used in Training Ground/Workshop research while Gold (the game’s premium currency) can be used to skip waiting times and recruit premium characters. New players who do not intend to spend should save their Gold for premium packs in the future. Building upgrades. Woodbury, the game’s hub, contains various base-building elements found in many other mobile games. Structures become available as the Town Hall is upgraded, with costs and building times ramping up as each rank is reached. Choices. From time to time, the player will be presented with a two-way choice which will affect the game’s overall story. Reward variations can be given based on your decision. Skipping cut scenes should be avoided if the player intends to make a well-informed choice. Pointer text displayed above a player’s choices can be misleading at times. Tokens. Upon reaching milestones or completing raids, the player may be awarded tokens to roll in the game’s Recruits and Rewards section in place of gold. Players who have not yet reached a sizeable roster size are advised to hold on to their character tokens until more space is available. Weapon tokens can be spent at any time since there is no storage limit to weapons. A similar guideline should be observed when claiming achievement rewards since resource storages may not be able to contain them, or unspent resources may be stolen through enemy raids. Upon reaching milestones or completing raids, the player may be awarded tokens to roll in the game’s Recruits and Rewards section in place of gold. Factions. Players can create or join factions, offering help in missions through a hiring system which rewards users with tokens for every time his/her top character gets hired by other players. Regions. Players can start from scratch by switching regions in the game’s Settings screen. The player can move to a new region with a different Raid leaderboard in tournaments as well as new Factions. Gold amount remains constant regardless of regions, and all progress is kept in the game’s servers. If a player has not yet connected to Facebook, a full reset can be performed by logging in to Facebook in-game from another device, and using that same Facebook account on the main device to resolve the save data conflict. The game will prioritize the new Facebook save over the account in the main device. Reaching level 5. Upon reaching level 5, a new mode named the Road Map is unlocked for the player. This mode offers a chance to run missions with increased rewards upon completion. Road Map missions require energy at a slightly increasing rate. Players should take advantage of each stage since Road Map missions are on a timer and are constantly changing. Be the first to comment on "The Walking Dead: Road to Survival Basic Guide"